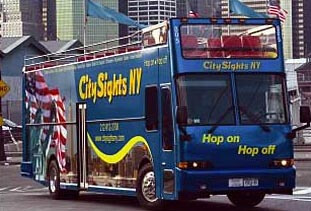 One of the fastest ways to see New York's sights is to take a tour on a double-decker bus from City Sights NY. Starting at $37 per day and person, you can hop-on and off all day, and have a professional guide letting you know what you're seeing. I've written about New York as a destination before, and with all the New York City attractions, there's a lot to cover. My first visit was all too short, and we had things to do so not much sight-seeing time except for a stroll in Central Park. But Central Park, Greenwich Village, NY Chinatown, and much else is just scratching the surface. With one of the City Sights bus tours, you can quickly get acquainted with this massive city, and then spend the rest of your time developing your 'relationship' with New York City in more detail. Prices start at $37 per adult, but goes up to $79 for a Super NY Tour which includes pretty much all of Manhattan, but also the Statue of Liberty, tickets for Empire State Building, a harbor cruise, and an excursion through Brooklyn. This gives you lots of options, from checking out the basic layout of the city to finding out pretty much everything during a full day and evening. Once you're done with the bus tour, the major museums, such as MOMA, will be waiting. I've taken a bus tour here in London just after I moved here, and doing one in New York would be a great way to likewise get to know my wife's home town. Last updated by jack on 18 February, 2008 in Travel.